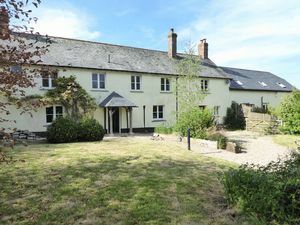 PEACEFULLY situated TRADITIONAL Devon farm with VIEWS OF DARTMOOR and comprising a RENOVATED PERIOD FARMHOUSE, an attached stylishly presented BARN CONVERSION and an ANNEXE set down a long track in about 23.12 ACRES OF LAND with 'PARKLAND' PASTURE, FISHING on the River Okement, WOODLAND, WILDLIFE POND and STREAM. Set in a delightful tucked away location surrounded by beautiful countryside and reached by a long farm track of about a third of a mile, this rural lifestyle property offers multi-generational living with its three homes or potential income from residential or holiday letting. 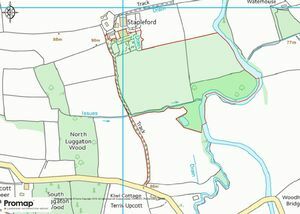 The appealing land of some twenty three acres also offers alternatives for being used for grazing horses, cattle or sheep on the pasture, in conjunction with a large farm building which could be utilised for livestock housing or adapted to provide (American barn style) stabling for horses. 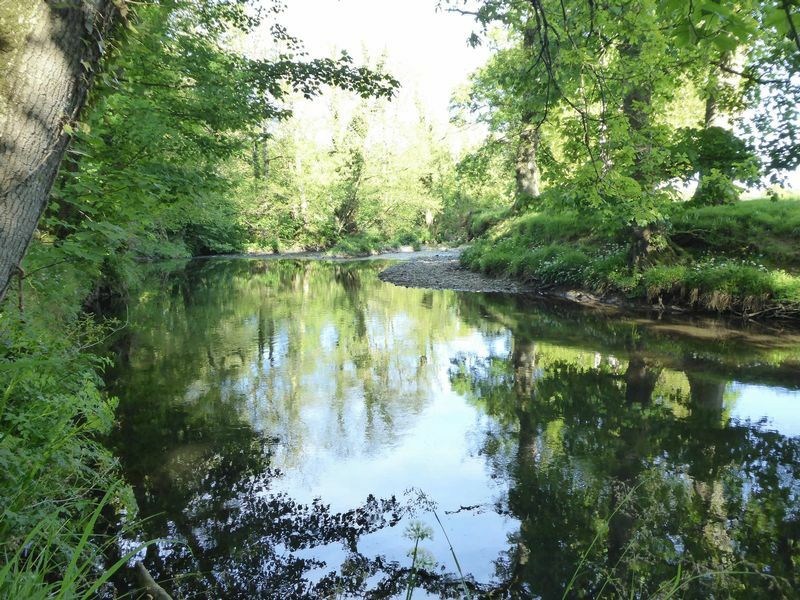 A special highlight of the property is a magical area of woodland of about 4.6 acres which runs along part of the River Okement including roughly 580 yards of fishing rights on part of the bank, which is known for its brown trout and occasional sea trout. 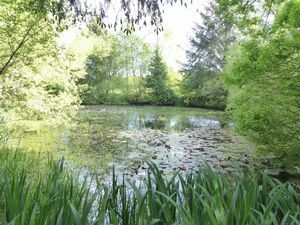 The woodland extends to about 4.6 acres and includes a stream and large lily pond and a mixture of oak, birch, ash and beech trees among others. 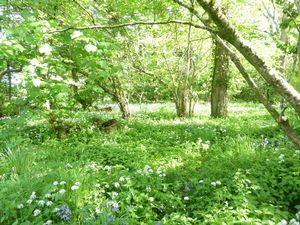 The delightful carpet of wild flowers including primroses, bluebells, wild garlic and orchids. 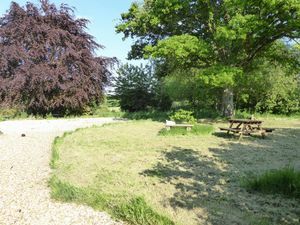 There is also an open glade area which would be delightful location for glamping accommodation. 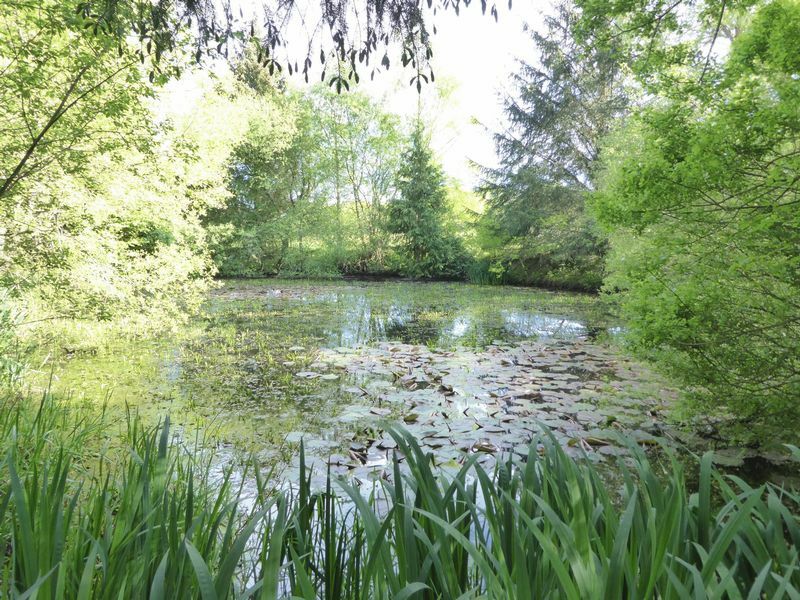 Peaceful setting would be of interest to buyers who are keen on wildlife. 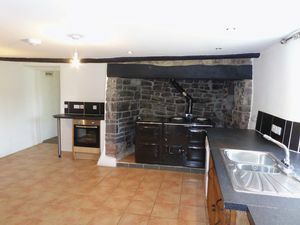 The traditional farmhouse is South facing and has oil fired central heating and features include two large stone inglenook fireplaces, oil fired arger in the kitchen and wonderful views across the gardens, land and to Dartmoor in the distance. 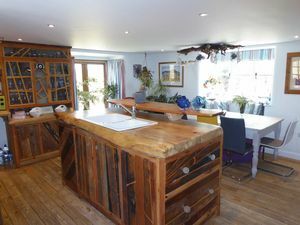 The attached barn conversation which has interconnecting doors to the farmhouse offers different style accommodation with stylish accommodation also with South facing aspect and views across the land to Dartmoor and its own extensive gardens. 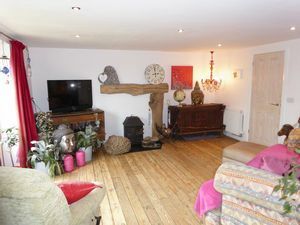 To the rear of the farmhouse is a single story one bedroom annex, suitable for either dependant relative or possible letting. 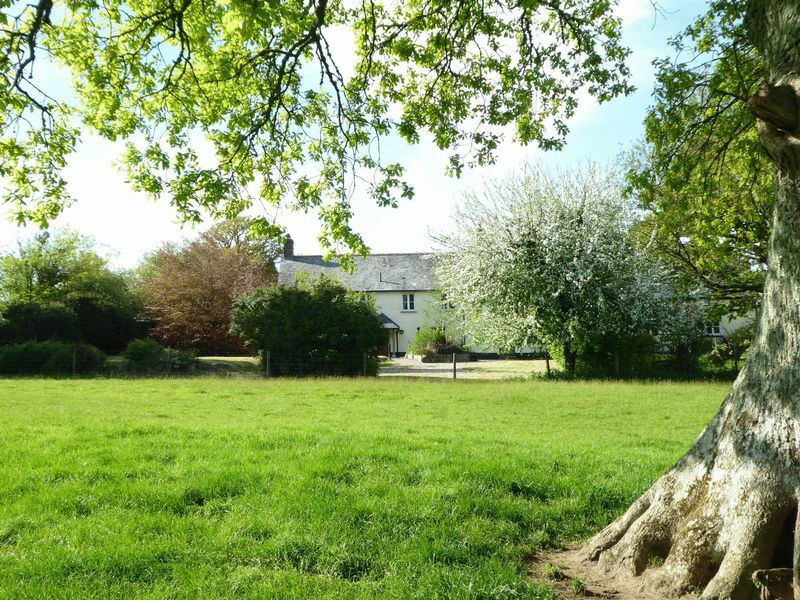 The farm is set about three miles from the village of Exbourne which offers parish church, public house, garage and well-regarded local Shop and Cafe. Hatherleigh is about two miles distant and offers a wide range of shops, a couple of pubs, doctor’s surgery, and sports clubs and other facilities. 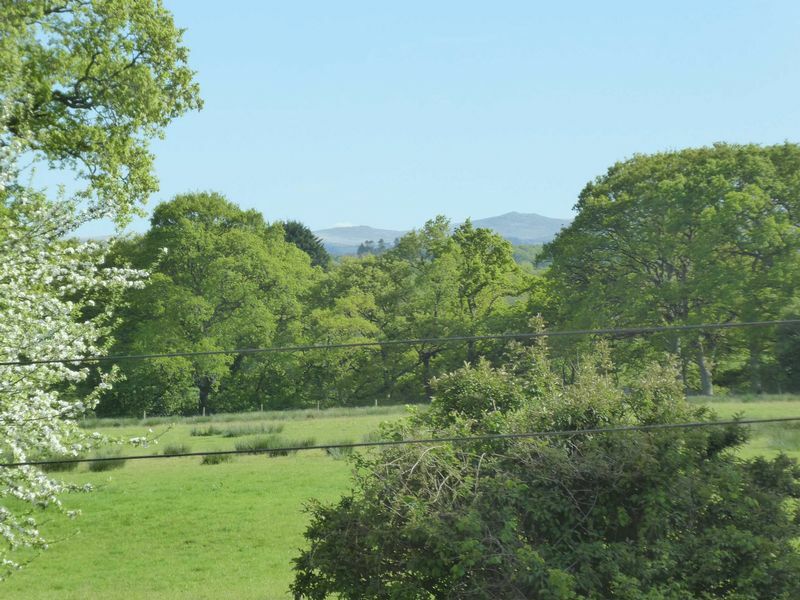 the formal town of Okehampton lies about 7 miles to the South with high street and supermarket shopping including Waitrose, primary and secondary schooling, golf club, leisure centre among other facilities. 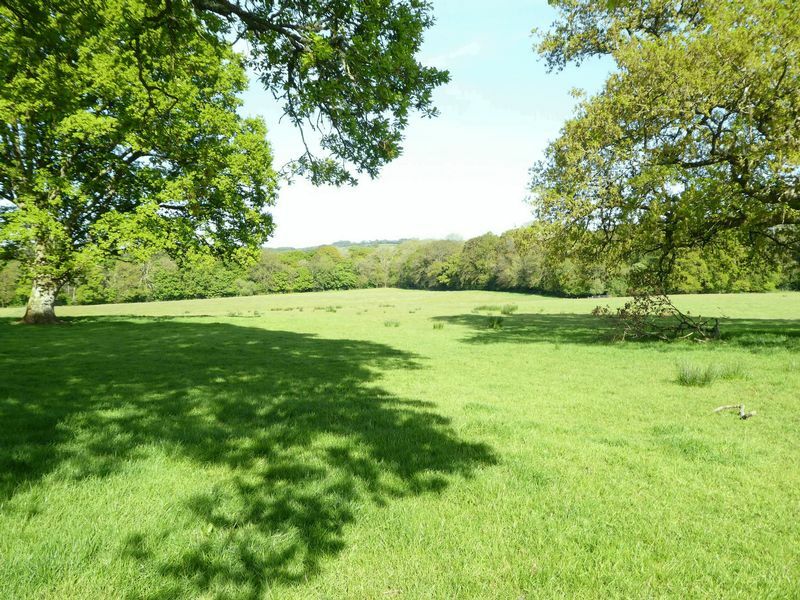 Just beyond the town is the A30 dual carriageway giving good access to the Cathedral City of Exeter or West into Cornwall and just to the South of Okehampton is also the wild expanses of the Dartmoor National Park. The coast at Bude can be reached just under an hour by car. 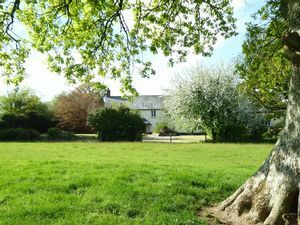 The farm is set about three miles from the village of Exbourne which offers a parish church, public house, garage and well-regarded local Shop and Cafe. 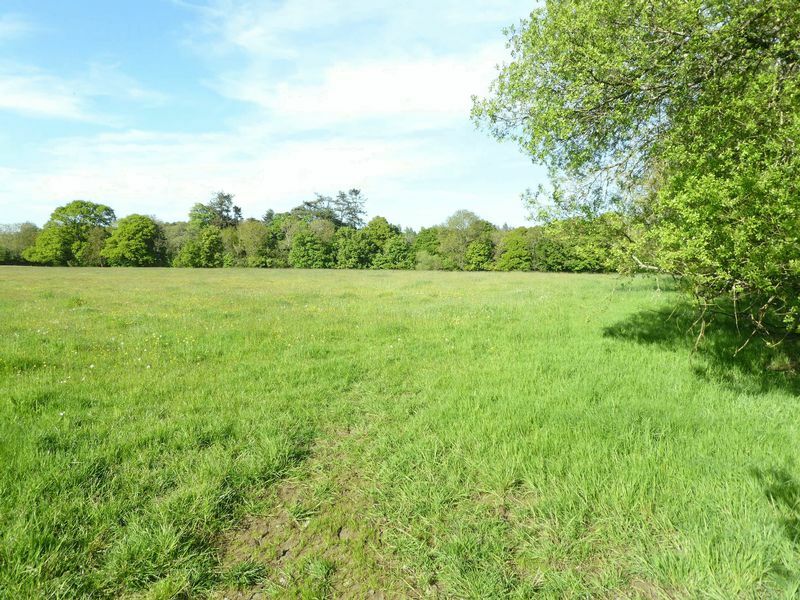 Hatherleigh is about two miles distant and offers a wide range of shops, a couple of pubs, doctor’s surgery, and sports clubs among other facilities. 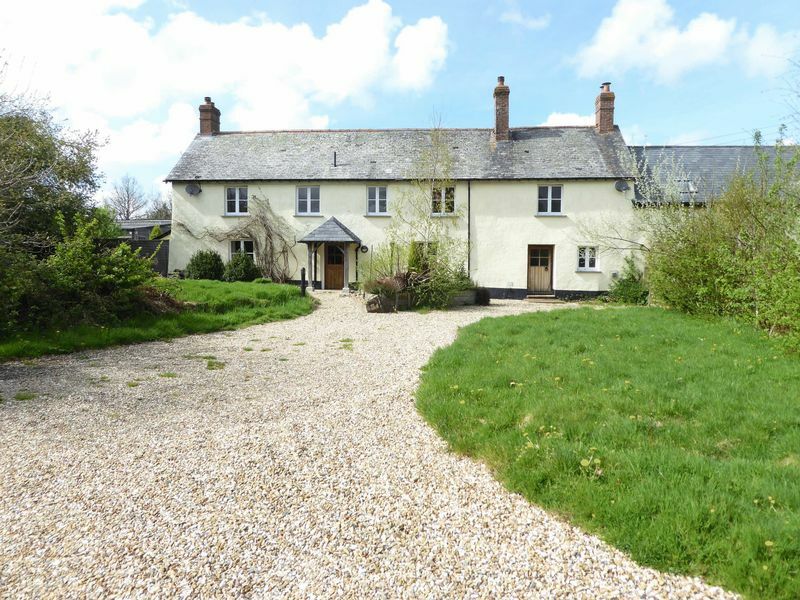 The former market town of Okehampton lies about 7 miles to the South with high street and supermarket shopping including Waitrose, primary and secondary schooling, golf club and leisure centre among other facilities. 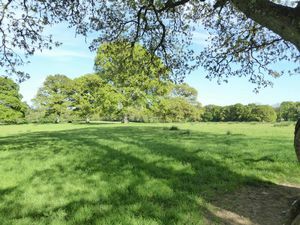 Just beyond the town is the A30 dual carriageway giving good access to the Cathedral City of Exeter or West into Cornwall and just to the South of Okehampton is also the wild expanses of the Dartmoor National Park. The coast at Bude can be reached in just under an hour by car. Oak part glazed front door with storm porch, staircase to first floor with under stair cupboard. Tiled floor. Radiator. Coat hooks. Smoke alarm. Pedestal wash hand basin. WC. Radiator. Tiled floor. Extractor fan. Part tiled walls. Window to front. Three exposed ceiling beams. 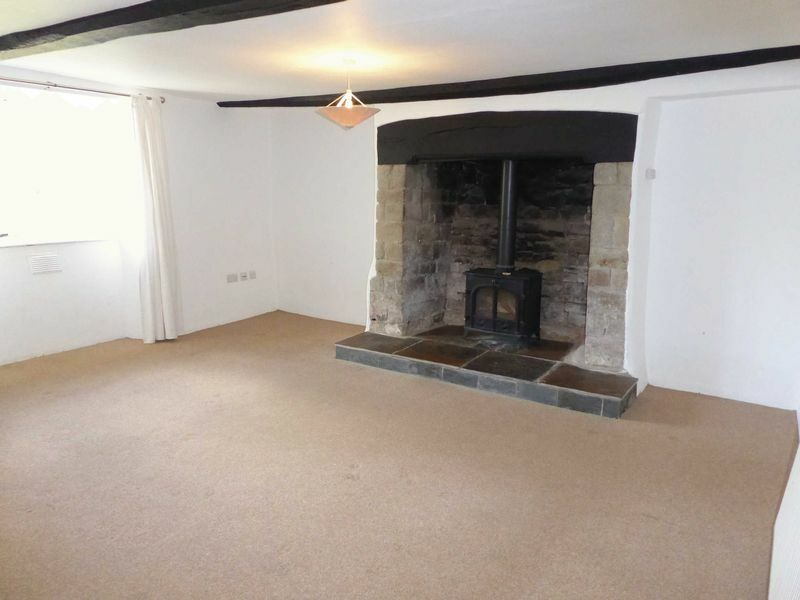 An impressive period stone fireplace with wood burner stove and carved lintel. Two radiators. Telephone and TV points. Window to front. 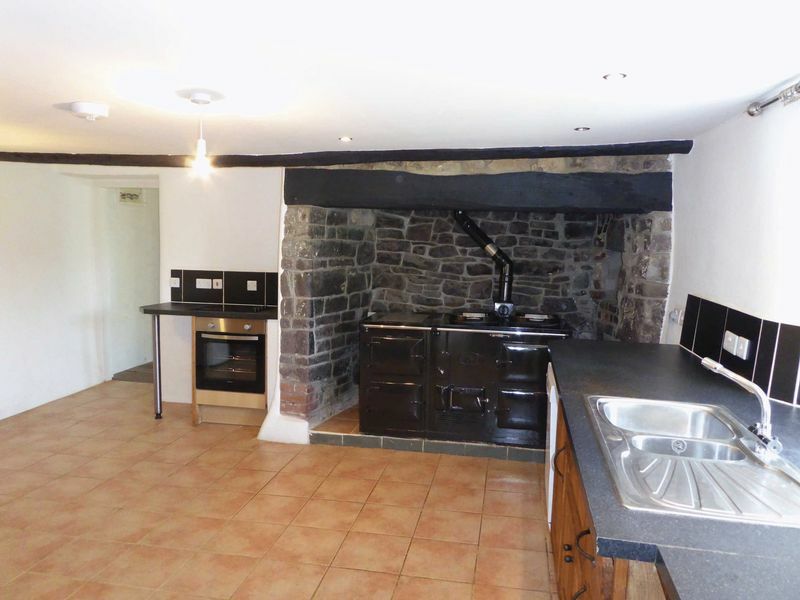 Impressive stone fireplace with oak lintel cloam bread oven and within which is a four oven oil fired Aga. Tiled floor. Hand made solid wood kitchen cupboards with worktops over. Inset one and half bowl sink. Radiator. Inset electric hob. Electric oven and grill. Exposed ceiling beam. Oak floor. Window to front. Part glazed oak door leading out to the gardens. 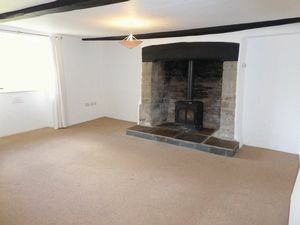 Fireplace recess with wood burning stove and bread oven. Radiator. Electrical RCD consumer unit. Cupboard housing oil fired Trianco boiler providing central heating and hot water. Oak floor. Connecting door to barn conversion next door. Part tiled walls. Shelves. Plumbing for washing machine. 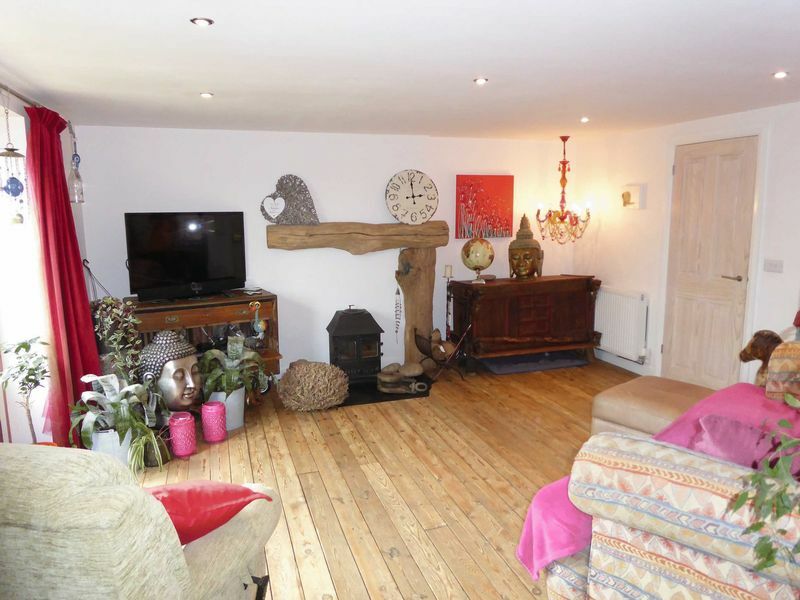 An impressive long landing with wide oak floorboards. Window to rear. Four recesses. Two radiators. Loft hatch. Smoke alarm. Period doors leading off to the bedrooms. Airing Cupboard: with hot water cylinder with immersion heater fitted and slatted shelves. Window to front with view over the gardens, land and tors of Dartmoor in the distance. Two shelved recesses. Radiator. Built in wardrobes. TV and telephone points. Window to front with views. Part tiled walls. Ladder towel radiator. Panelled bath with mixer tap. WC. Hand basin in vanity unit. Corner shower cubicle with Mira electric shower. Window to front with views. Radiator. TV and telephone points. Built in wardrobe. Window to front with views. Alcove. Radiator. TV and telephone points. Built in wardrobe. 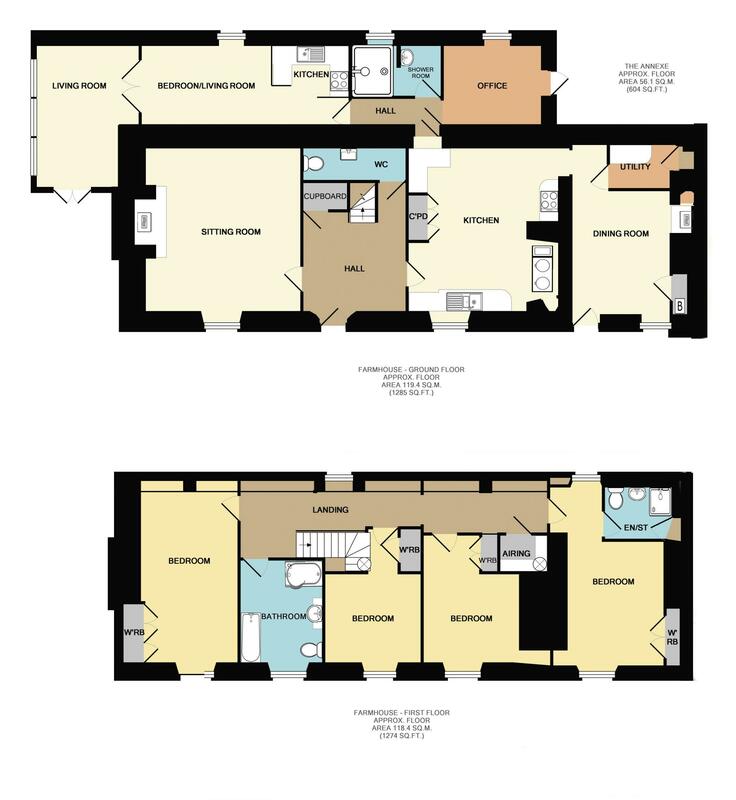 Dual aspect with windows to rear and front with views. Built in cupboards and drawers. Alcove. Radiator. Shower cubicle. Pedestal hand basin. WC. Ladder towel radiator. Extractor fan. 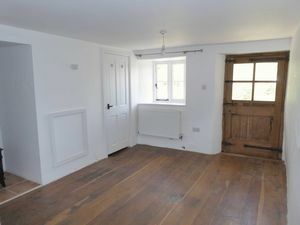 Interconnecting door to the barn conversion. Part glazed entrance door. Window to rear. Loft hatch. Exposed timber. Hall. Blocked doorway to farmhouse kitchen in recess. Radiator. Smoke alarm. Loft hatch. RCD consumer unit. Electric metre board. Blocked doorway to farmhouse kitchen in recess. Radiator. Smoke alarm. Loft hatch. RCD consumer unit. Electric metre board. Window to rear. Fully tiled walls and floor. Triton electric shower. Pedestal hand basin. WC. Electric towel radiator. Electric fan heater. Window to rear. Shelved recess. Radiator. Tiled floor to kitchen area with range of floor mounted units with worktops over. Stainless steel sink. Electric hob. Part tiled walls. Exposed timber. TV and telephone point. Glazed double doors leading to bedroom. Double aspect with double glazed window to side looking out to its own garden area and part glazed patio doors opening to a gravelled patio area. Tiled door. TV and telephone points. Entrance door from the yard and drive to the rear. Staircase to first floor. Tiled floor. Window to rear. Radiator. Coat hooks. 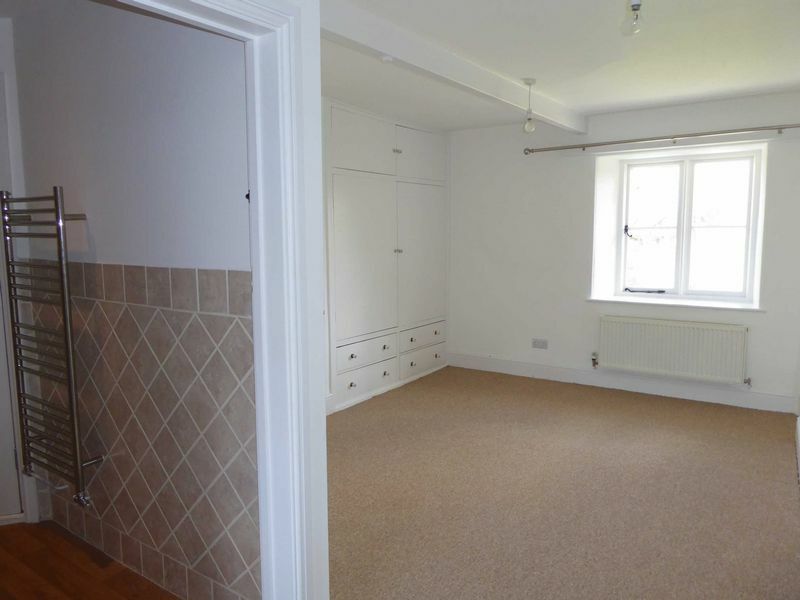 Walk-in cupboard (with blocked interconnecting door to house). Double glazed oak doors leading out the South facing gardens. Exposed ceiling beam. Exposed wooden floorboards. Recess. Two radiators. Wood burning stove. Glazed double doors open to study. Double glazed window to the rear with South facing aspect overlooking the gardens. Built in desk and shelf. Exposed wooden floorboards. Radiator. Oil fired boiler for central heating and hot water. Open doorway through to the kitchen/dining room. Tilled floor. Space and plumbing for washing machine and tumble dryer. Shelves. WC. Ceramic dog bath/shower. 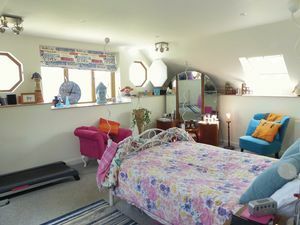 A delightful triple aspect room with double glazed French windows leading out to the gardens and patio. Double glazed windows to front with views across the gardens. Part glazed stable door to the rear leading out to the yard, parking and drive. Exposed floor boards. Window seat. Two radiators. Fitted with bespoke handmade kitchen by Chunky Monkey of Exeter including a central island unit. Inset one and half bowl kitchen sink. Built in dishwasher. LPG gas range cooker with eight gas hobs and three ovens. Dresser unit. Solid hard wood worktops. Walk in pantry with fitted shelves. 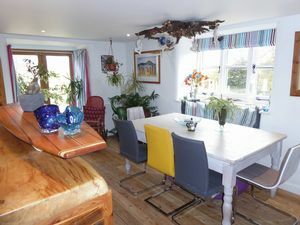 (NOTE: the tree root light fitting above the dining area and surf board fitting is excluded from the sale). Double glazed window to rear. Radiator. Loft hatch. Airing cupboard with hot water tank and immersion heater fitted. An appealing triple aspect room with velux roof light to the front. 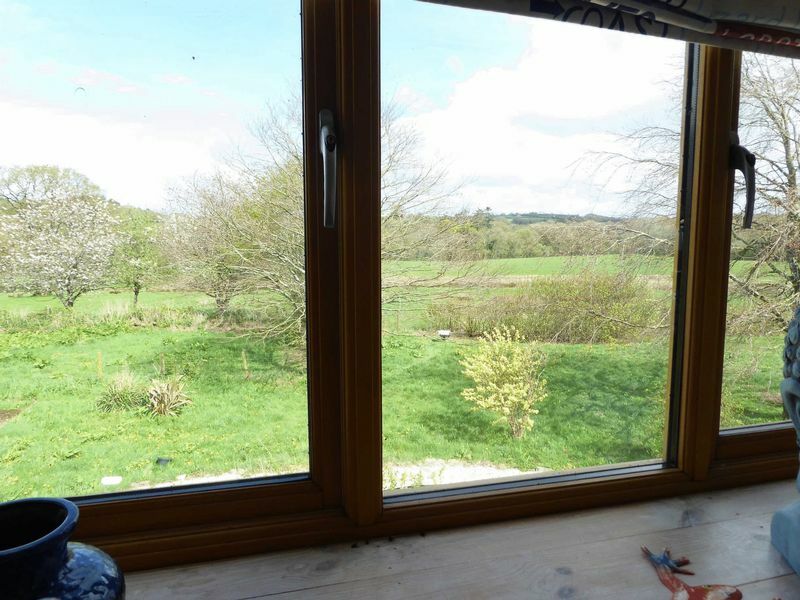 Wide window to the side with two octagonal port hole windows to either side with shutters and wonderful views. Deep shelf to three sides. Two radiators. Walk in dressing room. Linen cupboard. Velux window to front with view. Tiled floor. Tiled wet room shower with solid pine and glass divide. Tiled walls. Retro style shower. Ladder towel radiator. WC. Contemporary style hand basin on bespoke sculpted timber stand. Extractor fan. Panelled bath with Mira electric shower over with screen. Part tiled walls. WC. Pedestal hand basin. Ladder towel radiator. Extractor fan. Velux window with Southerly views. Radiator. 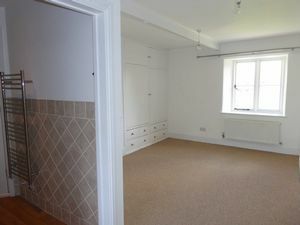 Fitted wardrobe and cupboards. Velux window to rear. Radiator. Connecting door to the farmhouse. 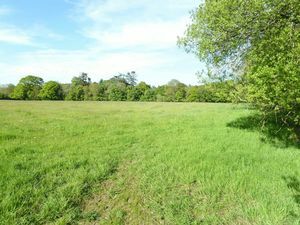 The property is reached by a long farm track of about 0.3 of a mile belonging to the property and with shared access by right of way to the two neighbouring properties and also farmers access to their fields. There are pleasant views across the land towards the farmhouse. 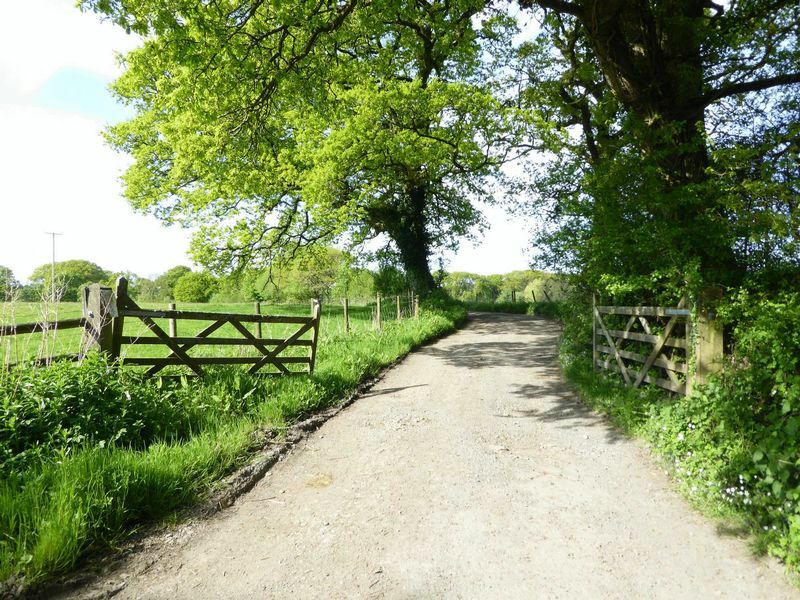 A gated entrance leads into a gravelled drive to the front of the farmhouse with a further gateway for access to the barn conversion. Also to the rear there is a concreted drive and parking area giving access to the annex, farm building and to the barn conversion. 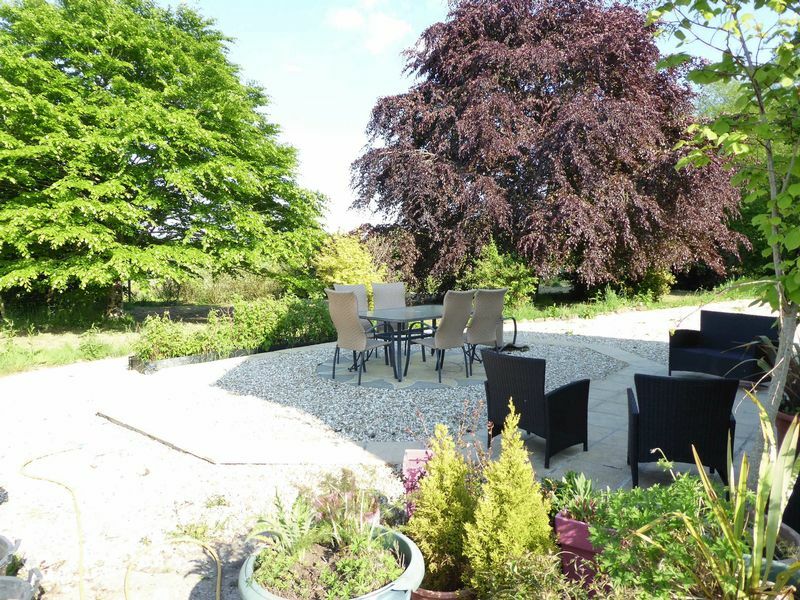 Each property has its own area of garden with the farmhouse having a lawned area with a mixture of trees and shrubs and with South facing views across the adjoining field. 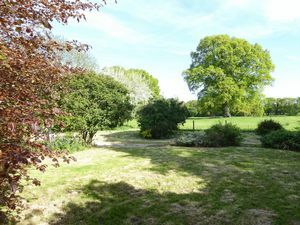 The barn conversion has a larger area of garden again with gravelled drive, lawned area and mature Oak tree and a number of other smaller trees with various areas of grass and gravelled and paved patio adjoining the kitchen, with appealing views over the surrounding countryside. 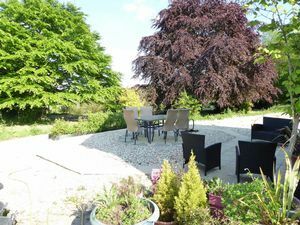 The annex has its own area of garden with gravelled terrace and raised area of lawn. 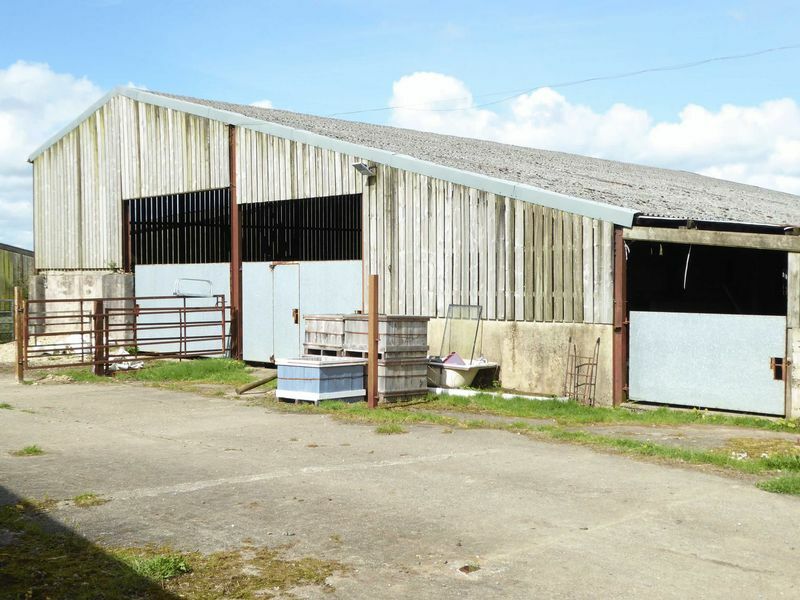 Steel portal frame modern farm building with mainly concreted floor with the potential for storage, or housing livestock or horses. 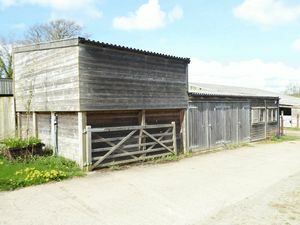 Adjacent to the drive is a wooden building divided into three areas as follows. Two windows to side. Concrete floor. Sink and unit. Water treatment and filters for the shared private borehole water supply. 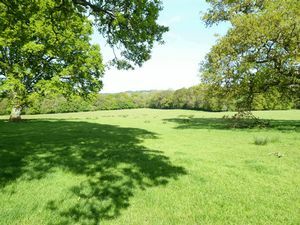 The property extends to approximately 23.12 acres in total of which approximately 15.54 acres are down to PASTURE with an impressive large field to the front of the farmhouse with attractive mature parkland style oak trees planted and running down to the tree lined stream on the Southern boundary. 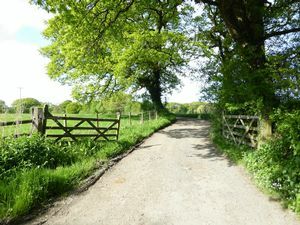 Another gate leads into a lower field running down to the river. All fences and with water available. By the farmhouse there is a small turn out paddock or poultry run area within which is the borehole for the water supply. 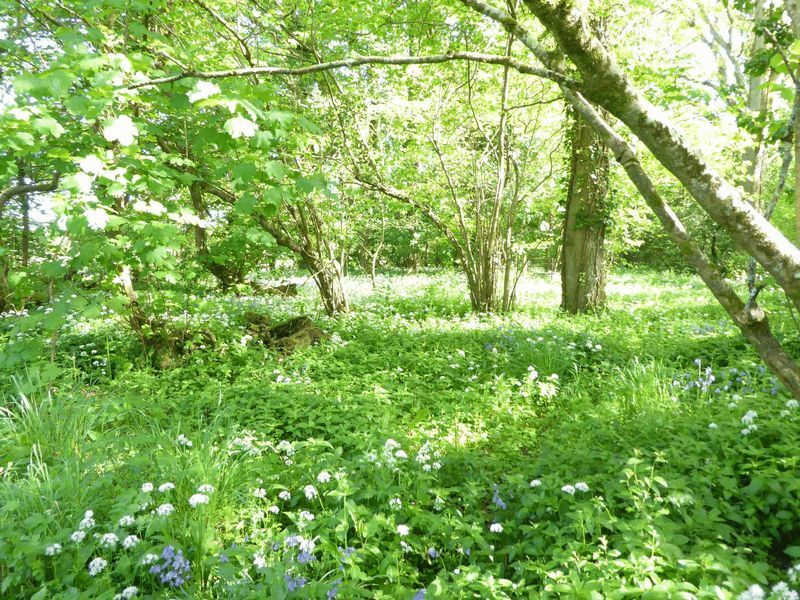 At the bottom of the land is the WOODLAND which extends to about 4.6 acres and is a delightful wildlife haven crossed by a stream with a large lily pond, with a thick carpet of wild flowers and variety of deciduous trees including oak, ash, beech, silver birch and hazel. 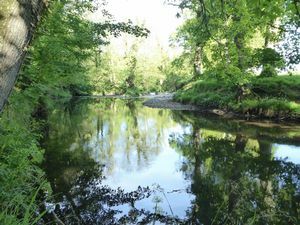 The Woodland adjoins the River Okement and the property enjoys about 580 yards of fishing. (NOTE: The fishing rights are excluded in one section belonging the property on the other side of the river). There are no public footpaths or bridle ways crossing the property. Mains electricity, shared private borehole water supply with the borehole located on the property. Private drainage with two septic tanks and soakaways. Telephone and broadband available. 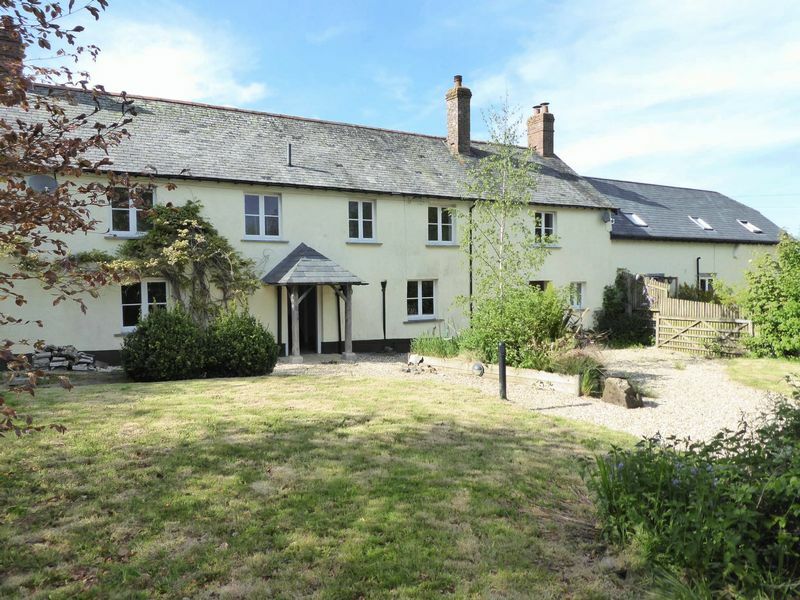 Oil fired central heating to the farmhouse, annex and barn conversion.